It's not new to us that online dating is a tried and tested way to find love and romance. But did you know that it’s the most popular with mature singles? In fact, according to a recent survey, 37% of coupled up folk over 60 met their partner online. Could it be that the older you get, the more likely you are to find success online dating? Here’s what you need to know. Believe it or not, adults aged 50 plus are far more flexible about how old their dates are. While singles in their 20s and 30s often balk at an age gap which exceeds 3-5 years, this gets larger the older you are. Singles in their 50’s, 60’s and beyond are far more concerned with whether their date is healthy, active and young at heart, which makes for a far larger dating pool. Keeping yourself open to options is recommended at any dating site worth their salt, so it’s no wonder that dating for seniors online is making such a splash. Top Tip: Widen the age range in the search filters on match.com by as little as 5 extra years on either side, and see how many more profiles there are to choose from! When you’re dating above the age of 40, the chances are that the singles you meet have some baggage or a story to tell. Single does not always mean available. This is especially true if they are getting over a bad break up or even a loss. Approaching someone who you know is single might result in embarrassment or upset if they are just not ready to move on. Online dating changes this dynamic. If they are signed up to a site like MatureLove, they are ready to get back in the dating game. This gives seniors the confidence to approach the singles they feel a connection to, and know that, with sensitivity, they are ready for a second chance at love. Top Tip: Don’t be afraid to ask your date about their past experiences, especially if they hint towards them on their dating profile. This is a new chapter, but is still connected to their whole story. Mature Singles love Tech, too! Studies are showing that senior singles want a chance to use state of the art dating tools like mobile apps, dating games and all kinds of new communication tools. But what feels intuitive and simple to singles in their 20s who have grown up on social media and the internet, might not to singles in their 50s and beyond. In fact, they might need a bit of extra guidance. 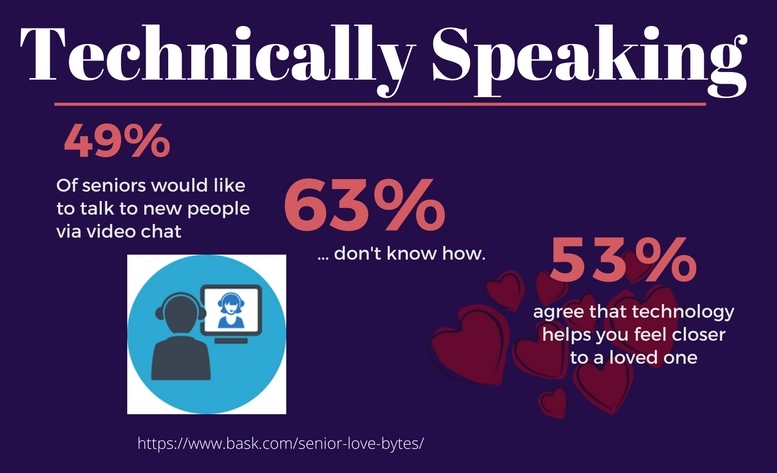 Most seniors would prefer a dating site which has some fun and innovative extras, but don’t want to feel old or incapable of enjoying them once they’re signed up. Top Tip: Check the help section! Sites such as Zoosk are technologically advanced and senior friendly, with tutorials on how to use their #1 dating app, plus all the gamified elements of the site. If you’re ready to meet someone special, our top over-50 dating sites are ready to help you get there. Get started!